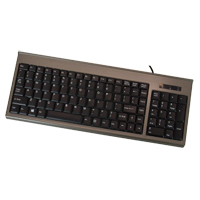 At just under 12” wide, and without a built-in numeric keypad to obstruct access to the mouse, the Scissor-Switch Compact Keyboard from SolidTek is designed to help users reduce the risk of overreach injuries to the tissues of the neck, shoulders and upper back. 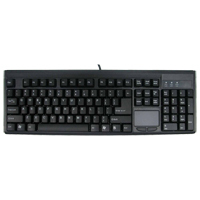 The alpha-numeric keys and the arrow keys are the same size as those on a standard keyboard, and the keyboard includes an embedded numeric keypad (activated by the NumLock key) and a two-port USB 2.0 hub. 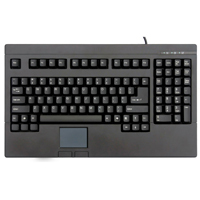 However, the size of the surrounding keys — the Tab key, the modifier and Delete keys, and the keys on the Function row — have been reduced in size to help achieve the keyboard's narrow design. 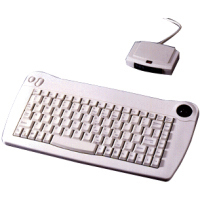 The scissor-switch keys, similar in look and feel to those used in laptop keyboards, contribute to the keyboard's low profile housing and its light weight. The key cap tops are flat rather than contoured to the fingers, and the key travel distance (i.e. the distance the keys must travel before striking the inside surface of the keyboard) is as low as it is on most laptops. Note: Those accustomed to typing by feel, rather than by sight, may find that uniformly flat key caps reduce their keying accuracy. 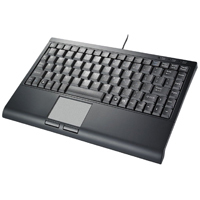 Note also that the keyboard has a slight positive incline, in spite of its low profile (i.e. it is 0.7” higher at the back than at the front). In general, a neutral (flat), or negative incline is advisable for those experiencing pain in the backs of the hands, wrists, or forearms. À seulement 12 po de largeur, et sans pavé numérique d`empêcher l`usage de la souris à la droite, le clavier Scissor-Switch Compact Keyboard de SolidTek est conçu pour aider l`utilisateur de réduire le risque de blessure associer avec s`étirer trop pour utiliser la souris aux tissus musculaire du cou, des épaules et le haut du dos. 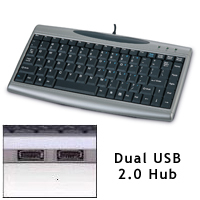 Les touches alpha-numériques et les touches flêches sont de taille standard, et le clavier inclus un pavé numérique intégrer (activé par la touche NumLock) et un concentrateur à deux ports USB 2.0. Cependant, la taille des touches — Tab, Delete et touches modifications, et les touches Fonctions— sont réduit en taille pour aider avec la conception étroite du clavier. 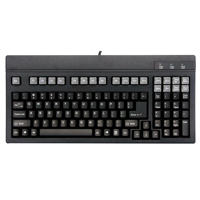 Les interrupteurs de membrane ciseaux, semblables en apparence et sensation de ceux sur un clavier sur un ordinateur portatif, donne le clavier un profile de boîtier mince et léger. Les capuchons des touches sont plat au lieu de courber pour les doigts, et la distance de l`interrupteur (c`est-à-dire la distance que la clé doit se déplacer avant de frapper la surface intérieur du clavier) est aussi bas que la majoriter des ordinateurs portatives. Veuillez noter: Les utilisateurs qui sont habitués à faire la dactylo par la sensation, au lieu que par regarder, vont peut-être trouver que les capuchons indentiquements plat réduit la précision. Veuillez aussi noter que le clavier à une petite inclinaison positif, malgré sont profile mince (c`est-à-dire c`est 0.7po plus haute vers le derrière que par le devant). En général, un clavier neutre (plat), ou une inclinaison négative est conseillé pour les utilisateurs qui ont des douleurs dans l`arrière des mains, les poignets, ou les avant bras. The Full Travel Mini Keyboard from SolidTek has the look of a laptop scissor-switch style keyboard but does not use scissor switches for stabilization. Instead a unique clover leaf keyswitch design stabilizes the completely flat keycap, preventing tilting both from front to back and side to side. The spacing between keycaps is very small compared to most keyboards, but the key pitch is standard, so the comparatively larger keycap tops are easier to target than on many keyboards. The key travel is a full 3.5 mm and the tactile rubber dome membrane switches provide a crisp typing feel. 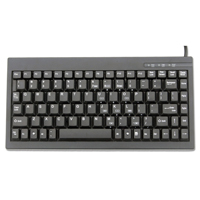 The Full Travel Mini Keyboard has full size alpha-numeric keys and key pitch, with all other keys reduced from a standard keyboard. 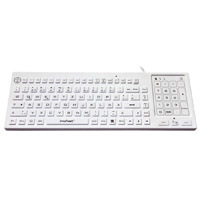 This allows the keyboard to offer a minimal 12" wide x 5.15" deep footprint on the desk, and at 0.85" tall, this keyboard is also portable if required. 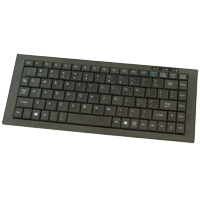 This keyboard includes an embedded numeric keypad which has blue legends, and is only available in a wired format (USB 1.1 compatible).